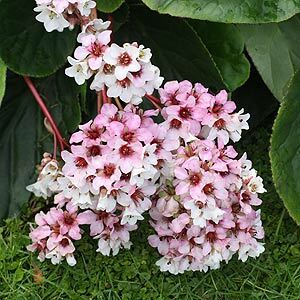 An old fashioned garden plant that wholesalers are now offering in more varieties than ever, Bergenia makes an excellent ground cover plant. Some of the newer varieties offered in Australia include ‘Baby Doll’, a low growing variety with attractive pink flowers. This variety flowers in summer and is well suited to growing in containers. Known as Pigsqueak, Bergenia comes in a number of species including the popular B. cordifolia. Used as a ground cover plant for light shade, its large textured foliage are an attraction year round. Low maintenance and with named cultivars having great flowers it is a useful landscaping plant in both domestic and commercial projects. All varieties require a well drained soil and will flower well in full sun, however some afternoon shade is best in warmer climates. Low maintenance and very hardy, they can be mass planted or grown in clumps for both the foliage and the flowers. B. cordifolia – The species with Pink flowers. B. cordifolia ‘Bressingham White’ – White flowering form becoming difficult to find in Australia. Bergenia x schmidtii – Vigorous form with pink flowers in winter to spring, however may spot flower through the year..